When Jim Fieldsend was just 48, he developed a severe headache. As the pain worsened, he was taken to hospital where it was found that Jim was having a brain haemorrhage. During the operation to relieve the pressure on his brain, Jim tragically had a massive stroke, which impaired his brain and totally paralysed the left side of his body. The months in hospital that followed are an all too forgettable blur in Jim’s memory. From being an agile man with a quick mind and vibrant personality, Jim now found himself almost completely paralysed and in residential care. He was told that he would improve no further. During this time of deep despair, one of Jim’s regular visitors was Jean, who remembers being appalled by the deterioration from the man she had known before the stroke. At this time, Jim could move only his right arm a small amount and it was difficult for him to communicate, though he could make himself understood. “Basically, I had a lucid mind in a vehicle that just wouldn’t function properly, ” he says. Jean continued to visit Jim regularly and successfully lobbied for him to be moved to a residential home nearer to her own home. 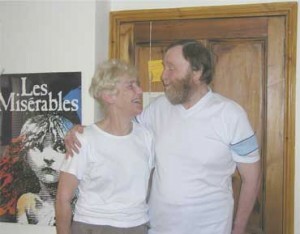 As the visits continued, Jim’s spirits gradually rose and he and Jean found themselves becoming closer and closer. Jim and Jean heard about the work of BIRD via the Stroke Association and decided to give it a go. Jim moved into a specially-constructed extension at Jean’s guest house and took up the BIRD programme in earnest. When a stroke has occurred, the brain needs to go back to its primary development. Jim had to re-learn his basic instincts. The exercises we taught Jim to do are specifically designed to do just that. Jim was some months into the BIRD treatment before improvements really began, when he became able to move his paralysed left leg slightly under his own control. His brain had begun to forge new pathways. After eighteen months Jim could stand and his ability to control his own body was growing by the day. Most importantly of all, Jean was as good as her word and the two were married. Jim was able to stand by Jean’s side, unaided, to take his vows. Not only that, but he was also able to make the wedding cake! Jean and Jim’s gratitude to the organisation that gave him renewed hope was such that they asked wedding guests not to buy presents, but to make a donation to BIRD instead. The final word goes to Jean who can see the transformation in Jim more clearly than anyone.